Somebody left my brain out in the rain. This is very likely the last post for this blog site...we're moving to a bigger and better (I hope) location! If you have a feed reader or link to this blog: please, please, please change the URL to http://www.missyisms.com. Thank you, I don't want to lose you! Please look to Missyisms.com for all new posts! Thanks again, and see you there!!! I'm pushing ahead in my attempt to get my blog migrated. I am now struggling with setting it up using Worpress.org software at www.missyisms.com. Check it out, but it's dusty and changing. 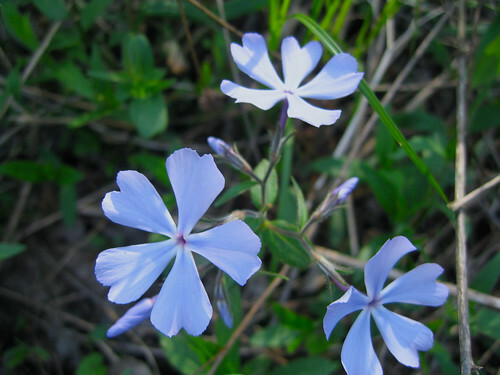 Hey all, I thought I would give WordPress a try, so today's entry can be found at missyisms.wordpress.com. Check it out and let me know what you think. Thanks. Hmm. Not so much a Locke problem anymore. Seeing double, Locke and load. Oh, and I think Richard is a pirate. Ahoy there, matey. Or perhaps I should say, "was" a pirate. 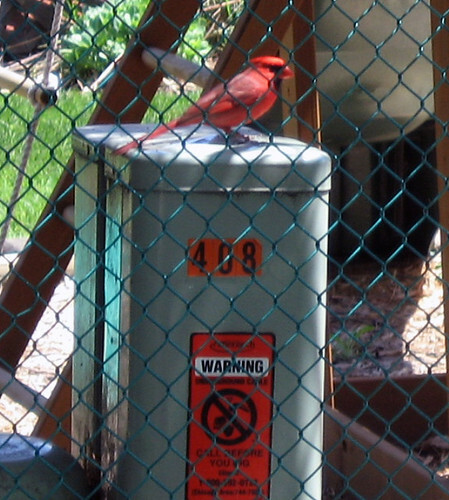 For a larger version of the image (and slightly better view of the cardinal), click here. Reggie usually ignores birds, but this time he charged. 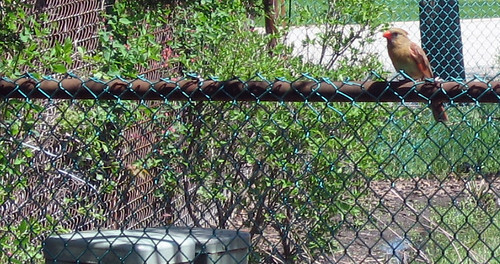 The cardinal wasn't too scared, he jumped the fence and showed us his superior profile. 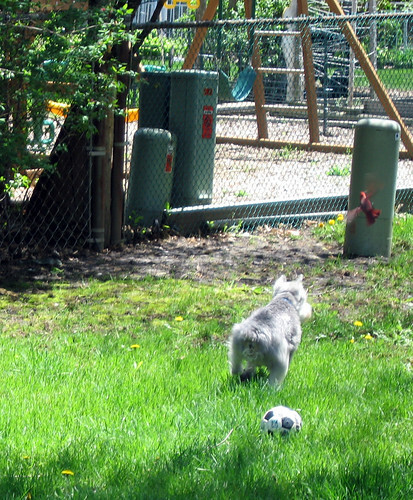 For all his bravery at simply clearing the fence, Reggie lost interest and set off to tour his kingdom yard. 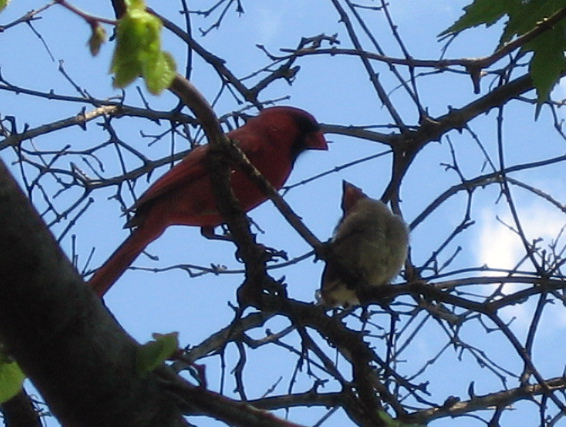 Since Reggie had moved on, the cardinal took to being a daddy and came back into my yard and feed one of his babes up in the tree. I sure wish I had a camera with a better zoom. I spent about an hour and a half "TechComming" with a friend of mine. I say "TechCom" because I don't really know what else to call it. We started with Skype. I was transmitting with both audio and video, but she didn't have a webcam and was only sending audio. We had a very poor connection, so I dropped the video. We were having a telephone conversation using our computers and the Internet (but you already knew that). Then we added Instant Messaging (IM) to our Skype communication. We didn't chat as we have in the past with IM, because we were Skpe'ing, but we employed IM to send some Internet links that we were discussing. We were also Twittering. Neither of us are prolific or even steady users of Twitter, so we couldn't figure out why my replies to her twitters (and other Twitterers) were not displaying on hers (or their) page(s). We eventually got it working sometimes, but agreed we weren't certain what we'd done and that the interface is annoying. What good is replying to somebody's twitter if it doesn't show up on his or her page? When she started discussing Torchwood, a show I don't know but read about this morning, so I directed her to a blog and then Facebook album to see pictures of a Torchwood sight. We also debated online-ordering tickets to the Harry Potter Exhibition. There's been a lot of press about the exhibit lately, so we're discussing going in early September when the kids will back in school. And now I'm using a blog to discourse about it. This would have been rather expensive in the past. Now it was no extra charge other than our already existing broadband connections. "Charming, simply charming!" But I don't know what to call this type of social interaction. We were using several technologies for communicating...thus I said TechCom. Did I coin this term or did I hear/read it somewhere? Is there another term I should be using? It's late Saturday night and the brain has checked out for the day. Somebody rescue me. May 7, 2009, 11:23 P.M.
Mark your calendar. I saw my first June bug of the year. There will be many, many more over the next few weeks. I decided to spare you a picture. Thunk, thunk, thunk (that's the sound they make as they smash into and grab onto to any screen near a light). All evening long...thunk, thunk, thunk, thunk. Maybe it will be an off year! One can only hope. I know, it's odd to me too that these June bugs come in May. It's even odder that they'll be gone before June gets comfortable. However, it was much nicer to see a June bug than the opossum I was three feet away from last night. Have you ever noticed that opossums are really ugly? 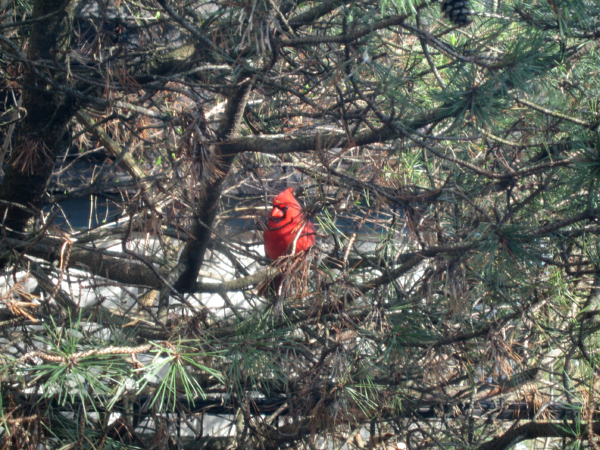 This was one tucked in a pine tree right outside my three-season room. It was not interested in leaving and I couldn't put Reggie out for an hour while waiting for the stupid thing to clear out! He even had red eyes...reallly, I'm telling you, ugly, ugly faces. This is so not the Sandwich and Salad blog I had originally planned. Sorry. May 7, 2009 11:23:00 PM | Misc. Get your own Nerd Herd badge here. Have you ever noticed that it's hard to type with a bruised fingertip? If you haven't noticed, today I can assure you it is true. I'm sure tomorrow it will be all better...or else. While the finger is hard to type with, I must admit the bruise on the big toe is much worse. I can see that bruise through my white socks. Oddly, the worst bruise doesn't hurt; I suspect it might tomorrow. Don't worry, I haven't been abused or tormented by anyone, but don't ask. If you are a fan of Star Trek you don't need me telling you that a new Star Trek movie is opening this weekend. The movie is a prequel to the original TV show, a.k.a. The Original Series (TOS), but also has a direct connection to the second Star Trek TV series, The Next Generation (TNG). To help viewers understand the connection between TNG and the new movie, the producers had a comic book series developed. Star Trek: Countdown was originally produced as four comic books. It's now available in multiple formats from trade paperback to comic books to Kindle* to iPhone/iPod Touch apps* and maybe others. Out of curiosity, and because they were cheap (only $.99 each), I downloaded all four parts via iTunes and read it on my iPod Touch. The work done to re-create a comic book for the Touch/iPhone is remarkable; the graphics are detailed, colorful and pop off the screen. I'm not a comic book reader, so I can't comment on the artwork as far as comic books go, but it was very easy to read and enjoy on the Touch. To see what I'm talking about, click the iPhone/iPod link above to view the sample screens...they look better on the device. I also compared the content to the trade paperback, using Amazon's "Look Inside" feature, and it appears to contain all the original content (at least on the first few pages). I wonder if they'll try to explain the TNG connection in the movie or just jump in assuming viewers either know it or that the story works without the explanation. Since I have several friends that want to see the movie, I'm sure I'll be seeing it sometime after the opening crowds die down. If you see the movie before me, which won't be hard I'm sure, let us know what you think and about the explanation. "Live long and..." you know. *The Kindle and iPhone/iPod Touch links are to Part 1 of Star Trek: Countdown. Parts 2-4 are available, but must be downloaded individually. From a local nature center. Late last week Reggie got sick again with another bout of pancreatitis. It's probably my fault...I was thinking he was doing great! Silly me for thinking that way. Luckily we caught it earlier and he didn't get as sick as last time, which is great. However, the vets decided he needed to be on an IV again. Since Reg wasn't as sick, Reg didn't want to just lie around and Reg wouldn't calm down when the vets put him in a crate. After listening to him whine, cry, pace, dig, and howl for a little while, the vets decided I should take Reggie home and keep him on the IV here. Since Reggie wasn't as sick as last time, Reggie didn't want to lay in the crate here either, so keeping him still was a big challenge and at one point when I was taking him out he charged away from me yanking his IV so hard it bleed. It was not an easy time. Thankfully, since he wasn't as sick, the IV stayed on for less than 24 hours and he was switched to oral anti-biotics. The vets are hoping that these frequent bouts of pancreatitis are because of the prednisone, which we hope to lower his dosage again late next week. Oh, when they decide to hook Reg to an IV, they really wrap him up. 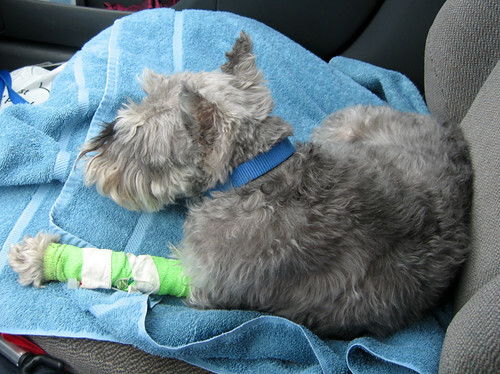 Here he is in the car on our way back to the vets to have the catheter removed. They practically put his leg in a cast...a good thing I guess since he yanked it so hard. You may have already caught this, but after TL showed it to me I've been meaning to blog it for weeks. Enjoy. For an explanation of the above video, see the extended entry. 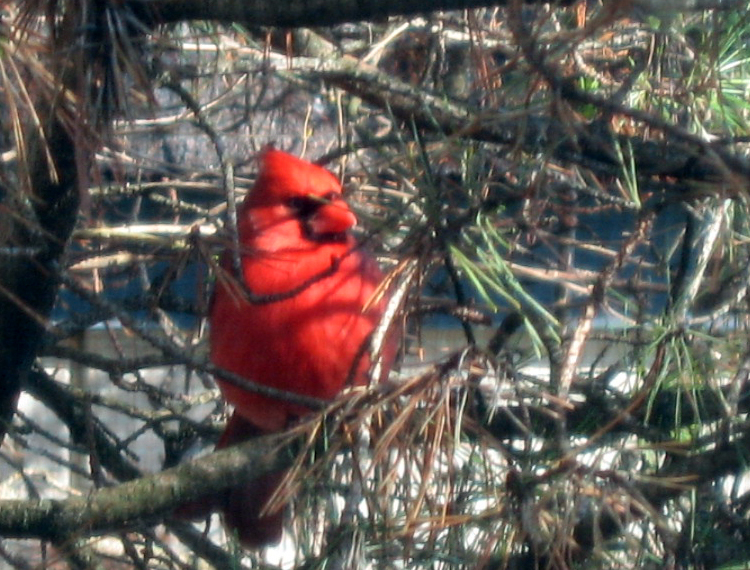 A cardinal enjoying the morning in my backyard pine tree. 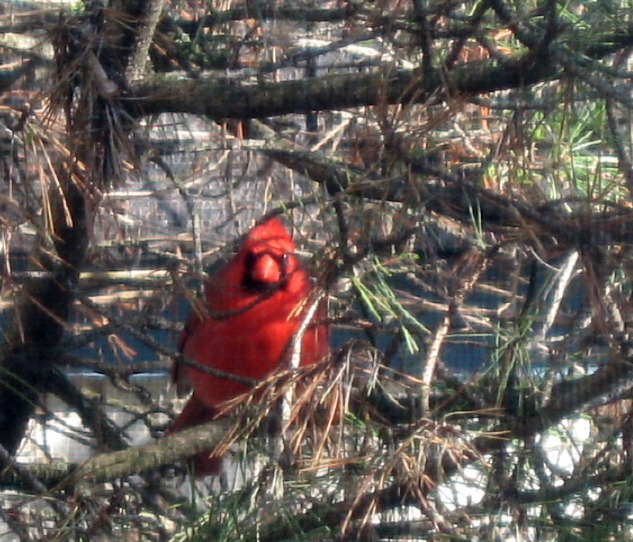 Unfortunately, I was taking the pictures through plexiglass and a screen, so the images are a little off. Isn't he beautiful? I wish the image below wasn't so distorted from the screen. You can actually see the screen in the image below. Sigh, to be so close, yet so separated. I went into the store today to buy a case for my iPod Nano (3rd gen, light blue, the fatty model). I figured since it's now a "previous" generation I better buy a case before they disappear and, to be perfectly honest, I assumed they'd be cheaper now than they used to be. Bingo, I was right! Here's why I want a case...I'm begrudgingly sticking my toes into the Velcro world. Unlike my father, I detest using Velcro on commodities. My dad is an expert at slapping a little Velcro here and there (he's also a master at gluing things, which is fantastic...no kidding here). Pop has a cordless phone sitting on top of the little TV in his computer room. He has the phone sitting there because every other surface in reach of the phone line is covered with paperwork, books, important knick-knacks (is that an oxy-moron? ), computer equipment (e.g., monitors, surge protectors, the tower, a fax machine, and a printer), and all his upstairs hi-fi equipment. He's a hi-fi nut, so that last grouping covers a lot of territory. That means the poor little cordless phone has no home other than on top of the TV. To make sure it stays on top of the TV, my father pulled out his adored Velcro and ta-da "nothing could be finer." I hate this. Now there's going to Velcro residue on top of that TV! It doesn't bother me about the bottom of the charger, but...ugh...Velcro stickiness on the TV for the rest of it's sad life. I'd rather be careful and occasionally knock something over (or find it a new home if it's breakable) than stick Velcro to my commodities. You'll not find Velcro residue on my TVs, computers, chairs, dog, beds, phones, shower, mirrors, tables, photographs, lamps, remote controls, bulletin boards, etc. If it didn't arrive with Velcro, such as the Velcro sown on my Teva sandles and a few jackets, then there ain't no Velcro on me. (OK, I admit it, my father doesn't have velcro on most of those items either.) Simply put, if it don't come with Velcro, it don't get no Velcro. That's the creed. Until today that is. I decided that since my car is dieing anyway, I might as well put a little snip of Velcro on the flat vertical part of the dashboard and stick my Nano to it. That way I can see the iPod and control it with greater ease and safety. However, with my aversion to residue of any type and, in this particular case, Velcro residue, I can't bring myself to stick Velcro to the back of my Nano. Don't bother to tell me I could probably scrub the residue off with nail polish remover...that might also ruin the Nano's bright shine (TL, I throw that word in just for you!). This brings us back (whew) to my opening paragraph. I looked over the case selection at the store...they had a few leathers ones, a few with flaps covering the front of the Nano, silicone ones, and plastic ones. I decided to go with plastic because it's cheaper than leather and I'm afraid the silicone ones will eventually tear since I'll take the Nano off the dashboard and hide it whenever I get out of the car. In fact, I bought four plastic cases as they were all bundled together in one package for $.99. Can't beat that price very easily! The case even swings open, making it even easier to hide the Nano when departing the car. I was all set, except for buying the Velcro with it's mandatory residue. Only once I got to the car and popped my Nano into the case, I discovered why those 99 cents weren't such a deal. Once you put the Nano in the case you cannot plug anything into the headphone jack! The case is too thick and close to the jack. How BRILLIANT is that? Nanos don't have speakers...you have to plug something into the headphone jack to listen to the device! But not with this case design, listening is not an option. I had to go through two lines to return the 99-cent package of cases (another brilliant design) and am back to the old method of having the Nano slide around on the console between the front seats, where I can't see or control it without picking it up. It's always nice to be thwarted by another person's "brilliance." Maybe they should have used Velcro or at least tested their product! Note to NBC: Bring on more CHUCK!!!!! Two seasons are just not enough! Note to readers: WATCH CHUCK!!! You'll love it! Reggie woke me up at 5:00 A.M. needing to go out. This was the first time since last Monday's crash that he did this. And, he was straining to have a bowel movement, which was a sign of problems last week. This made me nervous heading into his 10:00 A.M. vet appointment. Reggie is also not eating his regular dog food. The vets did several blood tests and a biopsy on the lump on his chest/shoulder area. All his blood counts are better, and some are even within normal ranges, but a few are still high. Not high like they were last week...one count was over 6,000 and should have been below 1,800...but still too high. All good news. Also, the lump is a fatty deposit and benign, so nothing to worry about. Because Reggie had bowel problems and isn't eating properly, they switched him to canned food, which I am disappointed, but resigned, about. He's been eating better today. Monday and Tuesday of this week Reggie's energy levels had been increasing and he'd been very cheerful and sweet. Today, Reggie has slept and been devoid of energy. So, mostly good news, with some concerns mixed in. But as the vet pointed out, last week Reggie almost died...he's definitely improved since then! Two drugs Reggie takes the whole pill. One drug he takes 3/4 of the pill. Two drugs he takes half a pill. One drug he takes 1/4 of the pill. Two of the drugs I have to cut. Two of the drugs the vets cut for me. One drug Reggie only takes at night. One drug Reggie only takes in the morning. One drug has to be taken about 20 minutes after the others or he'll vomit. How many drugs does Reggie take? Just kidding, this isn't a math test. Since Reggie's illness last week I've been scrambling to get caught up. I don't know if I'll ever make it, but I'm trying. If I owe you an email or a call, I hope it will be coming soon. Tomorrow morning Reggie and I go back to the vet's for follow-up blood work. Late last week Reggie's liver, kidney and pancreas counts were no longer off the charts, but they weren't very good either. (Reggie's liver counts haven't been good for years.) Also, Reggie's red-blood cell count had dropped since Monday's reading and his white blood cell count was elevated. Hopefully, the anti-biotic medications and the Prednisone will have helped improved these numbers. Reggie's liver is so big it's pressing against his heart. This might, or might not, be caused by the Prednisone. Last Monday we lowered the Preds, but since then his red-blood cell count dropped...but that might be because we lowered the Preds or because of his infection...we don't know. He also has a lump near his elbow/chest. Since Reggie first got IMHA and started on Prednisone in November, his body mass has changed. So I don't know if this lump is new or just part of the way the steriods are affecting his body. I don't know what Reggie's future holds, but I strongly suspect there will be a lot of monitoring via the vets. Reggie is home and resting peacefully. Wow! Just yesterday morning they were asking me how much effort I wanted to put into keeping him alive. That was when they suspected leukemia or cancer. Once those were eliminated, and the focus shifted to severe pancreatitis and bad infection, his chances improved, but they are still shocked at how much better he got today. He's off the IV. I've been giving him about a teaspoon of food every half hour to see if he can hold down food since he hasn't eaten since Monday. He's taken a few of his medicines in pill form instead of via the IV. If he starts throwing up or gets worse again, he'll have to go back on the IV. Many of his liver, kidney and pancreas counts are still high, but not off the chart like they were earlier. He's been peppy and happy, and is now sound asleep. He's pretty weak and can't jump into his favorite chairs, which annoys him. And more seriously, his liver is so swollen it is pressing against his heart. He'll be on anti-biotics for a while. They also noticed a lump near one of his shoulders, but we didn't get really get to explore that. And his voice is raspy. I don't know the long-, or even, short-term effects of all of this, but right now he is miraculously better! Thanks for all your comments and emails! In other news, the HVAC people were so late and I had to leave at 5:00, so they only installed the furnace and will have to come back to re-connect the humidifier and install the a/c. This is rather annoying. I've also noticed that there is a high pitched noise coming out of one of the cold air returns that was never there before. They'll have to fix that. It also makes a humming noise when it isn't running. You have to be in the utility room to hear this, but shouldn't it be completely silent when it isn't running? Does anybody have a similar issue? I hope Reggie and I can sleep through the night. We're both exhausted. We need a quiet weekend...lately that hasn't happened, but maybe this time. Reggie and I both are wiped out exhausted, but he's the only one smart enough to be in bed sleeping. Sigh. A quick update. Reggie was not well this morning, so the vets changed his anti-biotic. This seemed to help. His temperature has dropped some...very good...and he looks better. His ultra sound showed an enlarged liver and pancreas, but the other organs, including the kidneys and spleen, looked good. No sign of leukemia or cancer...excellent news. Right now the vets think Reggie has severe pancreatitis and an infection. And though he's better, he's not out of danger yet; the kidneys need to start working properly. He drank some water when we got home, which I think is a good sign. He's been sleeping ever since we got home, but I'll need to get him to go out soon. Reggie will spend tomorrow at the vets again. This is good because tomorrow my new furnace and a/c are being installed and the house is going to get cold. My good buddy CP is coming over in the morning so I can leave the workers in the house and take Reggie to the vets. God bless her!!! Hopefully they'll be finished with the install by 5:00 PM so I can return to the vets and get Reggie before they close. I don't know what the weekend will hold for us.